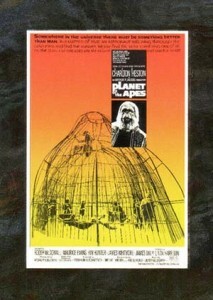 When it comes to Sci-Fi, Planet of the Apes is one of the greatest franchises of all time. While it's easy to laugh at some of Charlton Heston's lines, it's still a groundbreaking film in many regards. 1999 Inkworks Planet of the Apes Archives is the most in-depth set to tackle the original films, delivering a rounded base set, the series' first autograph cards and more. The base set has 90 cards. The first two films get 18 cards each while the final three are summed up with nine cards a piece. The checklist is rounded out with deleted scenes, key characters and behind-the-scenes activities. Leading the chase are Autographs. While there's no Charlton Heston or Roddy McDowall, it does include Linda Harrison. As some of the only autograph cards in the franchise's history, they're still held in fairly high regard. They came out at a time that autographs weren't guaranteed hits and Inkworks never officially released insertion rates. 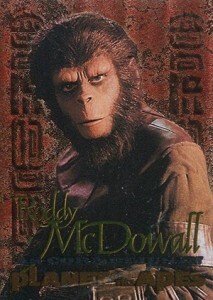 McDowall is the focus of his own insert set, Roddy Revealed. The four-card foil set highlights characters and films he appeared in. They land 1:27 packs. Poster Gallery (nine cards, 1:17 packs) offer a look at international art used to promote the films. The final insert is a die-cut Future of Liberty Copperworks card. Although it's inserted 1:108 packs, it's not overly rare as it's the only card in the set. The checklist is rounded out by three different promo cards. 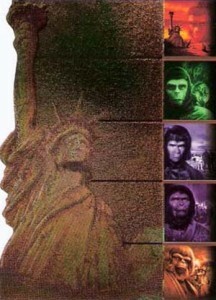 1999 Inkworks Planet of the Apes Archives boxes come with 36 packs of eight cards. 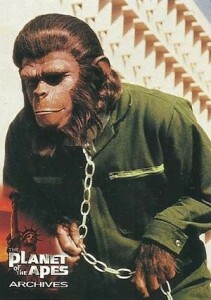 1999 Planet of the Apes archives trading cards - PROMO cards #P1 and #P2. 11 Freak or Missing Link? 16 "You're So Damned Ugly"
60 "Can't We All Get Along?" 5 cards. Insertion rates not announced. 9 cards. Inserted 1:17 packs. 4 cards. Inserted 1:27 packs.